A boy and his dog run experiments in a lab. They enjoy each other’s company, and the science that follows. After one curious accident, Dr. Brainchild seeks to find the solution, which involves popcorn. 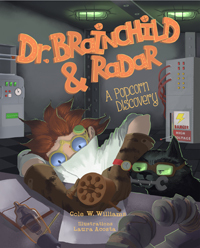 Cole Williams is the author of Dr. Brainchild & Radar: A Popcorn Discovery. A silver-medalist for the 2017 and 2016 Nautilus Awards, she has previously published Hear the River Dammed: Poems From the Edge of the Mississippi, Charlie​: A Child’s Tale of Grief, Loss & Love, and Eukarya: A Child’s Guide to Knowing Names of Nature. We are happy to have Cole with us on Book Riot. Dr. Brainchild & Radar: A Popcorn Discovery is a fun tale that talks about the importance of experimenting and happy accidents. What was your inspiration, to go with popcorn? Fun question! I am one of those people that walks around in awe of my surroundings. How technology has advanced with lightening speed throughout my parent’s lifetime always gets me to pause and look at something with wonder. Also, I began to get really interested in the evolution of technology and science after working in a research lab and finding old laboratory equipment in the cupboards. With rapid advancements, computers and machines become archaic so quickly, yet many of these relics were still on my lab bench. I loved them! Old scales, old timers, tickers and glowing button, big goggles and cabinets of glassware. Just as in the movie, Hidden Figures, that shows the size of the original computer (the size of an entire room), I wondered what else was before us that has gone through rapid change to be part of our lives, without us even thinking about it. I saw a photograph of the first microwave and was astounded at the size and science that went into its discovery. The magnetron housed inside each microwave really captivated my attention; this is a really wonderful device! The comparison of old to new made a great story for children in my mind—I thought they would get a kick out of seeing a series of books that show the original invention next to what they have in their home. Popcorn was true to the scientist, Percy Spencer’s story. He actually did use popcorn to make the discovery! I knew that I wanted to concurrently teach children about the importance of ‘going back to the drawing board’ and experimenting until something came to fruition. This is the beginning glimmer to the scientific method shown in a fun way! Studying science can become really complicated, especially in the upper grades. When writing about science for children, how do you approach language and terminology for explaining these processes? Yes indeed, and the way I studied science all throughout college and then after was to make the topic into a story. I would fictionalize everything I could and watch it come to life in my head. Depending on the topic this is easy or a real challenge! When writing for children of a younger audience (or even adults that studied other branches of interest in their lives) I try to make sure that I am capturing the essence of that story instead of focusing on the terminology. If a young reader has an experience with my books, they will be getting very real science concepts but may not necessarily know it yet. Later, when they get asked what a protist is or what it means to experiment, they will have that base already built in and reflect on it fondly I hope. That distillation process is the real challenge of my writing and why I love it. I think to myself, “Okay, how can I take this magnificent system and bring to a young one, so they can get started loving it too?” There is no need to wait. Science has become an over-wrought word that should really mean: to be curious, to wonder, to explore, and this can apply to anything, not only the quintessential science topics we are told are appropriate for children. Anything can be approached with the true scientist mind, which for me is that perfect pairing of imagination and drive to ask new questions. What do you enjoy best about writing for children? First and foremost, what I love most about writing for children is their honesty. This audience will tell you with their posture and attention very quickly if the story is working for them. I also love their excitement and lack of fear to ask questions. It took me a long time to get back to that fearless student in college that wasn’t afraid to ask silly questions in physics or chemistry class. Go for it! That is the best way to learn! What is also fun, is being able to meld a non-fiction story or concept and then blend in a fictionalized character or other made-up elements. Dr. Brainchild can be anyone, anything, go anywhere! This allows my work with the storyline and illustrator to be bold and different, as we create a world together that is inclusive and invites everyone into the fold. It seems that the older we get, the less fun science becomes in the classroom, and in STEM programs women and girls are discouraged to pursue those fields due to ingrained prejudices and societal pressures. How can we bring the fun back into science? The guardians of our children can do a lot to off-set this imbalance our culture has found itself in, and it is not necessarily to place your child into a program, although that could help, but I believe, it is more about exposure to wonder and encouraging boredom, messes and experimentation and to not give up! Art is easy to love for most kids, art is art! It is already wondrous, and contemplation is built into it as well as recycling/re-doing and experimentation. There is less fear about being wrong in art in early stages, and you get your hands dirty getting to know art. We almost use more scientific approaches to learn art then we do to learn science! They way that most of us are taught to study science is awful. Cram it in and there. That should do it. How drudgery to go to that every day. I studied science with markers and pastels, white boards and colored paper. Videos! Movies! Field trips! Science is life. Sometimes you will find a genius teacher that gets this too, that uncovers the wonder behind the equations. When we get down to brass tacks, art is nature, nature is science, science is art. What to do when science class gets you down? Refuse to be rote! Take the time to find it in the world and get to really know it like we would with art. Talking about gravity? Go to the tallest building downtown. Talking about geology? Head to the nearest archeological site and feel the rocks. Wondering about compost, order some worms. Perhaps you want to know what powers the microwave, well take one apart or at least explode eggs in it, with supervision of course. Surround yourself with whatever science you think might makes sense for your life. There is a science topic for everyone. When you fall in love with the life side of science, then the equation memorization side is vastly easier to grasp. Your website mentions that you have a biology background. Could you go a little more into that? What do you like best about biology? Yes, I spent most of my high school years writing and going to poetry conferences. I studied grammar and advanced literature and avoided all science classes except the environmental ones because I didn’t want to risk my lowering my GPA. I had a knack for the writing and reading and didn’t give myself a shot really with anything else. Although, when I sat in my required biology labs, my professor said I did great and that I seemed to love it, but at that stage in my life, I was not willing to go further than the minimal requirements. It did not take long for me to come to the realization that I had sold myself short and didn’t give myself a chance to try even, so I applied to college for neuroscience and then biology. The voice of that high school professor was always in my head and I thanked him down the line when I became a laboratory scientist. What a travesty if every girl doesn’t hear that in school at least once, that it is your option to study this way too! I traveled to the Galapagos Islands for research and studied the things I love in life and got to write about them. My curious nature worked well in the sciences because I was able to ask any question and study it thoroughly. I moved right into laboratory research for a profession and carried that wonder with me. I was lucky to experience different types of research and publish academically. That prepared me for the editing process. The world is sometimes so much more bizarre and stranger than I could make up on my own. Scratch the surface of something long enough and you will see too, and I love surprises! If you could experiment in Dr. Brainchild’s lab, what would you study? Wow, I love this question! I would study my favorite thing on earth, cephalopods, especially the octopus. I would teach them to play games and study the way they camouflage the texture of their skin. I would figure out why they are so sneaky and hard to study in nature and probably become best friends with one before I let it go back into the wild and then I would be sad, but it would’ve been worth it. What upcoming adventures are in store for Dr. Brainchild and Radar next? And what other projects do you have planned? I am zeroing in on the next invention to explore, I think the second book will have more Radar in it and we will see the duo in a new environment, and as much as I would like to say more, I think I will save all that for next time! In the meantime, while Dr. Brainchild brews, I am releasing a book titled On Holiday Road next as well as finishing up my first novel that I wrote for a fun experiment. Both topics I mention here have a strong water theme.